Spring is a popular time of year for homeowners to list their properties for sale! 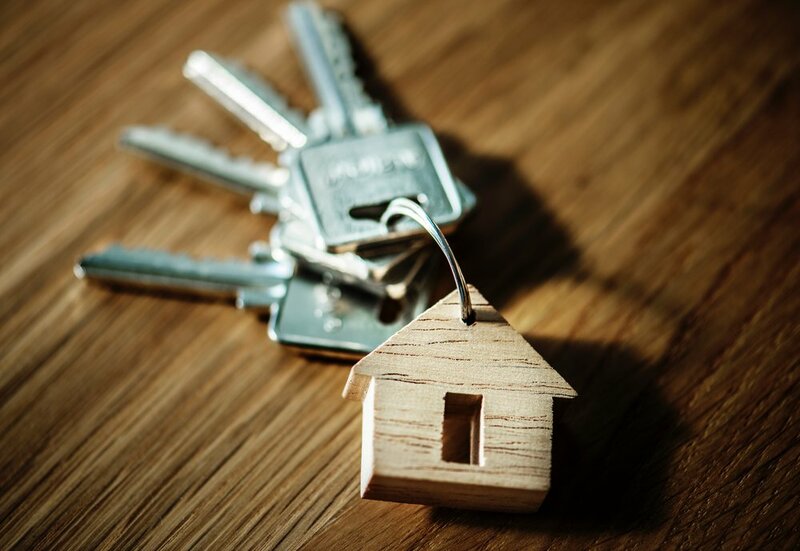 There is a lot you can do to help your home stand out in the sea of spring and summer listings. Today we’re sharing just a few ways you can step up your listing and earn top dollar for your beloved home! Walk around your home and notice how it flows. Does it feel cohesive? Open? What design features about your home can be highlighted? Every home has unique flare - both in the architecture and in the design choices. Accentuate the features that make your home special! Sometimes that means moving furniture around to create a more open layout. Or giving more attention to your landscape design. And if you have young children, sometimes that means keeping the extra kid paraphernalia hidden away so families of any age and stage can picture themselves in your space! If you feel like your space is dreary or unexciting, consider freshening it up with some new throw pillows, a coat of paint in a dull room, or a top layer of mulch in your flower beds. These little touch-ups will go a long way in the way your home is presented! This hopefully goes without saying, but a clean home will have much more successful showings than a dirty or unkempt home. Keeping a home clean for showings can be very challenging, especially if you have children. But it’s worth every bit of effort! From the time you know you’ll be listing your home, start slowly decluttering and deep cleaning each area of your home. You want potential buyers to know there is sufficient (and even extra) storage space for their belongings. If they peak into closets that are disorganized and overly full, they may wonder if your home provides enough storage. Of course basic cleaning is a must, but also make a list of deep cleaning projects that you can check off - maybe even just one per day! Things like dusted blinds, wiped down walls, pressure washed sidewalks, and shiny light fixtures will make your home bright and fresh! Right before showings, consider using an essential oil diffuser or candles to welcome potential buyers! The choices you make about your home’s design need to appeal to a wide audience. You want everyone who walks through your door to be able to picture themselves in your space! Using mostly neutral paint tones throughout, limiting the display of personal items, and choosing decor that showcases the beautiful design elements of your home (and doesn’t detract from them) are good places to start. Super taste-specific choices may turn off potential buyers. As already stated, you want potential buyers to be able to see themselves living in your home! One way to ensure this is to pay careful attention to your home’s functionality. How do the traffic patterns flow? Does the furniture arrangement in each room fully utilize the space? Is there too much furniture? And even though you probably don’t want people snooping around your cabinets and closets, you still want them to be ready and organized because people do look! Take a look around your home to catch any imperfections - chipped paint, crooked fixtures, loose door knobs, squeaky hinges - and spend a little bit of time fixing them, making your house stand out above the rest! We have received a lot of requests for more information on how we created this gorgeous ship-lap look-alike shower in our recent Clay Street project. So we’re going to spill the details on how we achieved this unique and functional look. Spoiler alert - it’s not actually shiplap! The two main objectives with creating this shower (or any shower) is making sure it’s durable and waterproof. We chose to use cement board for this application. It comes in wood grain, stucco, and a smooth texture. Cement board is designed to be completely waterproof and hold up under intense rain, wind, and even hail. This shower is doubly protected because we made it completely watertight even before installing the cement board. We used Kerdi-Board for this application. It is an amazing product! After installing the Kerdi-Board and cement board, we used a high-quality silicone in the grout lines to make sure every last nook and cranny would keep the water out! 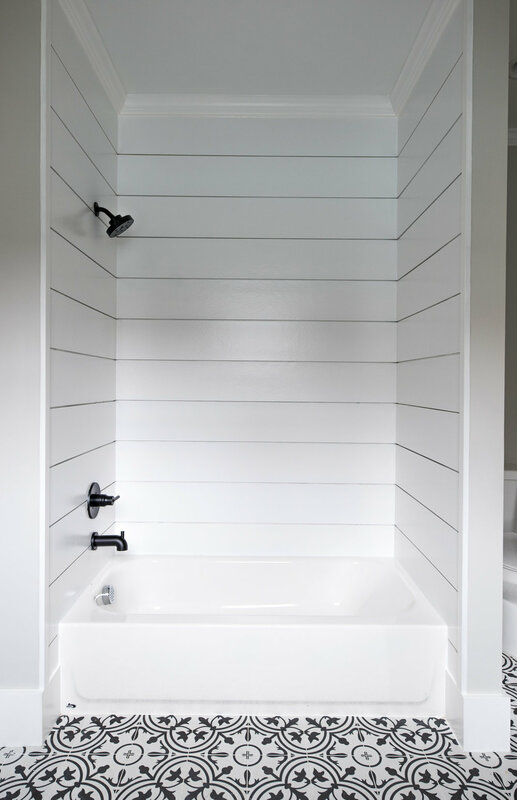 We finished off the entire project by painting the boards with marine paint (which is used on ships) so we knew it was a full-proof option for our shower project! You can buy marine paint from a marina or Home Depot and Lowe’s have options as well. There you have it - the short and simple version of this high-impact project! We’re incredibly pleased with how this shower turned out and we hope it inspires and helps those of you who are interested in this sort of look for your own home! I'm not sure if our family has had a "typical" day yet! Between my business, the farm, four teenagers (and all of their games, practices, and music lessons), and my husband's full-time job, each day brings on a whole new adventure. My husband and I make a great team, so we try to switch off which mornings we do the "chores" at home - feeding the animals (some are more picky than others - like those teenagers - and getting those teens on their bus. On the mornings that I don't do the routine at home, I usually try to hit the gym bright and early before work. As far as the design business goes, every day really does look different. My studio is located in an adorable downtown area near my house, so I will often go there to work on bids and designs and I also meet with a lot of clients! The traffic in Atlanta is absolutely crazy, so I try to work in the office for the first part of the morning - starting the day organized and grounded helps so much! After the traffic slows down, I'll head out for appointments with contractors and clients, shopping for materials, and inspecting projects. During this time, my husband is at work and the kids are at school. We all try to meet up back at home around 4:30 p.m.
Once the work day is over, I really try to embrace my role as a mom and wife. We do supper together and spend time as a family (even if it's just doing music practices and homework). Supper is very important to us - we put our phones away so we can connect, hear about each others’ days, and swap funny stories! Between the six of us, there is never a dull moment! 2) Which of your personality traits is most helpful for your work as an interior designer? It's always awkward to talk about yourself, so I asked one of my friends what she thought. She said, "Without a doubt, the personality trait that has made Tori excel is her design work is her adventurous spirit. Just a few years ago, this was a part-time hobby - where many people are when they start a business. 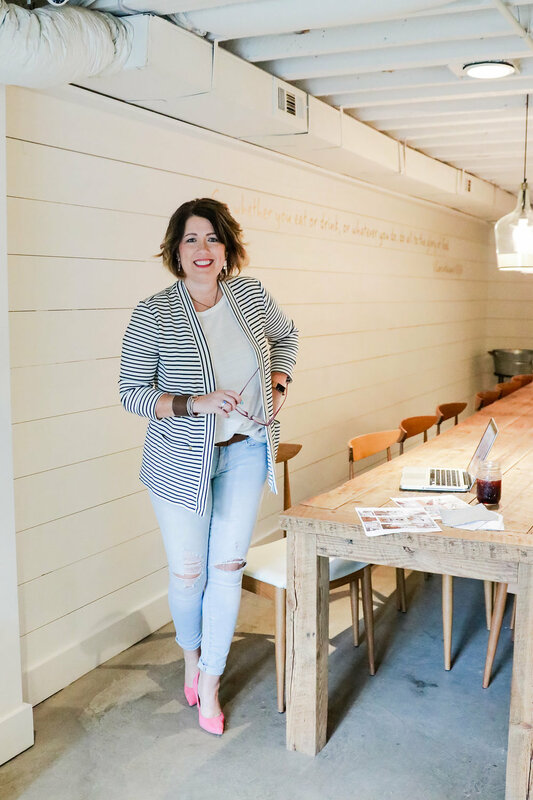 But because she was not afraid to put herself out there, to learn the tricks of the trade, and to take risks, she's taken her business from flipping old pieces of furniture to flipping multiple houses! I think her confidence attracts those who want to invest their money, and need someone who's sure they can make their vision happen - and that's Tori!" 3) Are you a morning person or a night owl? Without a doubt, a night owl! I get so much done after everyone is tucked into bed - the house is quiet and I can curl up on the couch with my laptop. No one is usually calling or texting to interrupt my time. I'm definitely not a morning person - my family is very familiar with my morning "wave" which they know means "good morning...I love you...but don't talk to me!" 4) What is your favorite Atlanta-area restaurant and why? This is a hard question because I love eating out and trying different foods! Atlanta has so many things to offer! Probably my most frequented restaurant would be one in the Avalon, a fun outdoor shopping center not to far from us. It's got stores, great restaurants, and a movie theater. El Felix is my favorite - great steak tacos, homemade tortillas (!! ), and chunky guacamole. Right across the street is Cafe Intermezzo, a beautiful little European cafe with decadent desserts and great espresso. 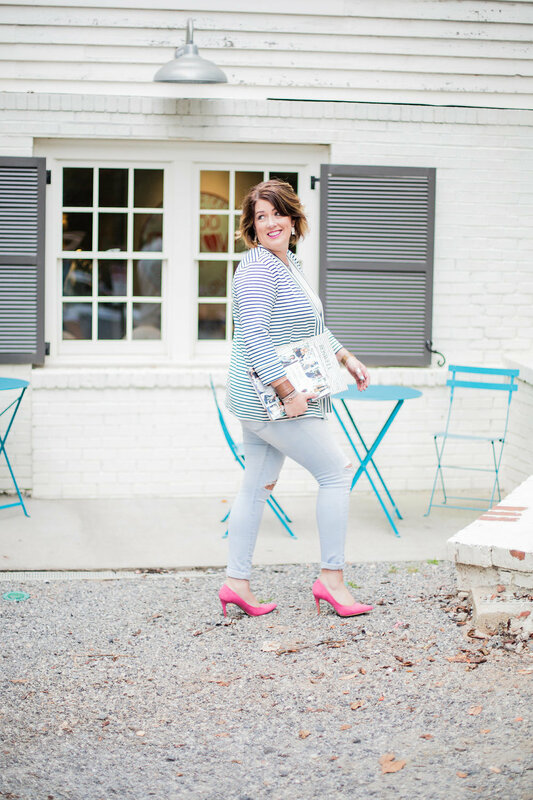 The combination makes a great girls’ night or date night with my husband! 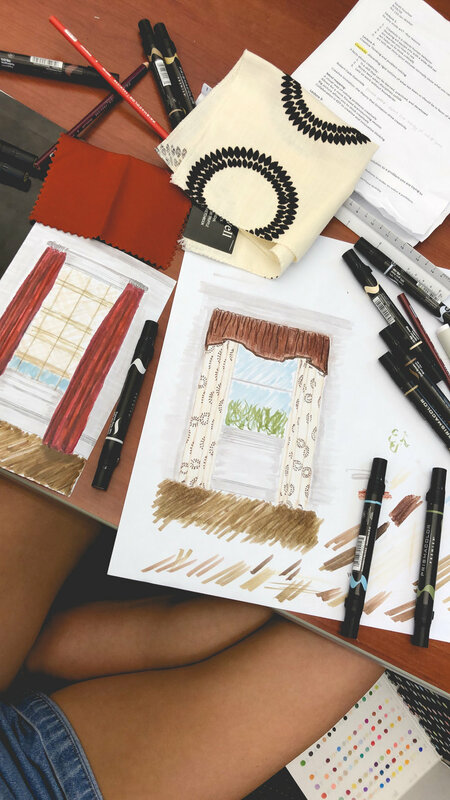 5) Have you always wanted to be in the interior design business or is this a career path that has caught you by surprise? Yes and no. I grew up as the daughter of a contractor so I was constantly around the building or rebuilding of homes, making them beautiful and functional. Around college, I decided I didn't want to be a part of that industry. I guess when it came time to "grow up,” I wanted to try something totally different than I was used to at home. After going to college, getting married, and starting a family, I just started being pulled back to design. Like my friend mentioned, I started buying furniture pieces from local yard sales, refinishing them, marketing them online, and selling them. Then, I started consulting for my friends who wanted to redesign their homes, refinishing kitchens. The next thing I knew, I was designing spaces, then whole houses! While I love interior design, I also love the architectural design side of things. It's fun to remodel or build onto a home to make it the perfect space for its family, and I feel like this expertise helps me when working with contractors and builders. 6) What is your favorite room in a house to design? Whichever one I'm currently doing! I love all the rooms and the unique challenges they offer. But, if I had to choose, it's probably a tie between kitchens and a master suite. For me, the kitchen is the heartbeat of my home. It's the place I gather most often with family and friends. So when I design that space, I want it to be the most functional room in the house, but also create an atmosphere that everyone wants to be in. I'm a huge romantic, so of course the master suite appeals to me also. I think every couple needs an oasis, where they can go to relax and rejuvenate together. Those moments are helped by simple luxuries, good design, and organization - and of course I always want to throw in some great spa-like features in the bathroom for those busy moms! 7) If you could travel anywhere in the world, where would it be, and why? Definitely Europe - I love the culture and the centuries-old beauty in the simplest of places. I have a painting in my living room that reminds me of a cottage in the French countryside! That's my happy place! 8) What is your favorite holiday tradition? Each year, our kids get a special ornament that kind of encapsulates their year or achievements. My mom did that for us, and it's so fun to have a tree full of memories. I also host a Christmas tea each year for the wives of the other pastors that my husband works with. We often don't get a lot of time to spend together because of all our busy schedules, so it's always fun to set a beautiful table, gather all the teapots, and enjoy food like scones and clotted cream together. 9) What's your favorite recipe to cook for your family? We are big fans of Mexican food! I grew up in Texas, so of course my entire family has been taught to love Tex-Mex. I like that it's quick and easy to prepare, and everyone can customize it to their liking! 10) What is the most rewarding part of your work as owner of Farm Chic Design? When we've taken a project from start to finish, and I get to see the client's face when they see the finished project! I put all my effort into each one of my projects, so there's a lot of joy in giving that finished project back to the clients I've grown to love! 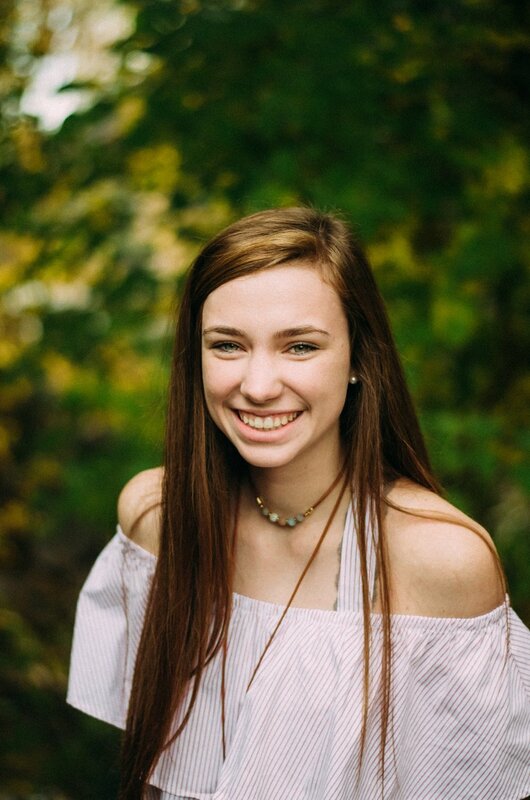 Meet Our Intern, Sarah Foushee! Hello! My name is Sarah Foushee and I’m a sophomore at Anderson University in South Carolina. 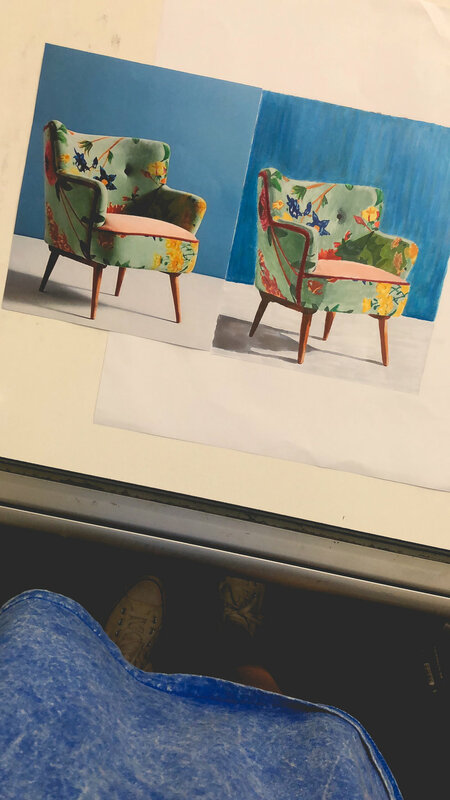 I am studying what I absolutely love - interior design! Ever since I can remember, being involved with interior design has always been a dream of mine. My interest began when I realized how much I loved rearranging furniture and decor in my own room and also that I thoroughly enjoyed perusing design websites. I would spend hours on Pottery Barn’s site making wish lists for my dream house! I also enjoyed watching countless episodes of HGTV shows with my aunt. I always imagined that one day I could be the one making someone’s life happier by creating comfortable and beautiful spaces. Farm Chic Design has made this dream of mine start coming to life! I was given the amazing opportunity to intern alongside Tori this past summer and help her with multiple jobs. I did a little bit of everything, from picking out samples to making mood boards for clients. I love working with Farm Chic Design because it allows me to get hands-on experience in the interior design field and practically do the things I’m learning in my college classes. Tori is so much fun to work with and makes every day a new and exciting adventure! Currently, I am in my second year of college and have already completed many design classes. Right now we are working on rendering, drafting, and we’re about to start learning Sketch Up. I just completed two projects: residential design and student housing. We were required to pick clients and design spaces that fit their needs. Between these two projects, I hand rendered five perspectives, a floor plan, and two elevations and also drafted five construction documents, selected samples, assembled six presentation boards, and three jobs books. At the end, we presented these projects to multiple external reviewers. I have already gained so much knowledge studying at Anderson University! My future dream after college is to work alongside a residential design firm and to one day maybe start a firm of my own. Securing this internship with FCD has pushed me closer towards my future goals and I can’t wait to see what else I will learn while I’m here! Some people are drawn toward neutrals. Some are drawn toward a lot of bold color! We’re talking today about how to beautifully incorporate color into your home in a way that is tasteful, budget-friendly, and cohesive! Adding pops of color to an otherwise neutral palette is a great way to add interest to your a space. Even if you’re naturally drawn to a subdued space, finding just the right ways to incorporate color will add a little punch to your room! If you’re inclined toward a lot of color in the first place, learning how to add it tastefully can be helpful. Because color choices are often trendy, adding them in bulk becomes expensive if you like to replace items as your tastes change. In addition, excessive color on top of color in a room doesn’t allow a place for the eyes to rest. So let’s learn the why + how of adding color to a space! We hope you enjoy these simple tips! Why should I add color? Color adds interest - it’s the spice of life. We see it all around us in the world! Including color in your space is an outlet for self-expression, allowing your personality to shine! How do I add color? I recommend starting with a neutral palette. It’s a great idea to make your larger, more expensive home purchases less colorful and more neutral. This would ideally be all of your large pieces of furniture. Mostly neutral furnishings will ground your space so you can layer colors and textures on top. Now, there is absolutely no harm in having a colored (whether bold or subtle) upholstered chair or desk, but try to keep the bulk of your pieces neutral. Then add color in items that are less expensive and can be easily changed out! Throw pillows are relatively inexpensive (depending on where you buy them) and at $20-$40 each, they can be changed out or rotated every season or every few years when you get bored with your current color scheme. You can also add pattern + texture with pillows! Incorporating color and pattern through curtain panels is really easy and not too expensive! You can often find sales on curtains that will allow your space to feel fresh and updated while keeping your wallet happy. This is probably the most obvious way to add color! And it might be the cheapest too. A can of quality paint costs anywhere from $25-$45 and can give your room a huge boost of personality! Whether you paint an entire space a muted color or go bold on an accent wall, the options are endless! Yes, wallpaper is trending again! From traditional glued-on wallpaper to removable peel-and-stick versions, there are many methods to incorporate wallpaper into a space. You can upgrade a small powder room by adding a punch of wallpaper to all four walls. Or you can give a nursery an extra special look by putting up a subtle or bold print (whichever strikes your fancy) on the wall behind the crib! Plants you say? YES! Plants are one of nature’s best sources of color! Go fill a cart at the garden center with a variety of houseplants - large + small - and you’ll watch your house come alive! Of course pay attention to lighting and watering needs. Family photos, art ledges, baskets, mirrors, vases, lamps, bedding, throw blankets, and other decor pieces are an obvious way to add color and contrast to a space. Trading things out every once and a while, moving things around your home, or grabbing something new at your favorite store or market adds a lot of visual interest and keeps things from getting boring! You can really have fun with these items - let your personality shine! Even though they’re usually a bit more expensive, a rug can also be a fun way to add a pop of color! Invest into a beautifully colored, timeless rug and it will bring your space life for years to come! We have some very exciting news!!! Farm Chic Design has purchased her first flip! We're celebrating the closing of the property today and can't wait to get to work on it! 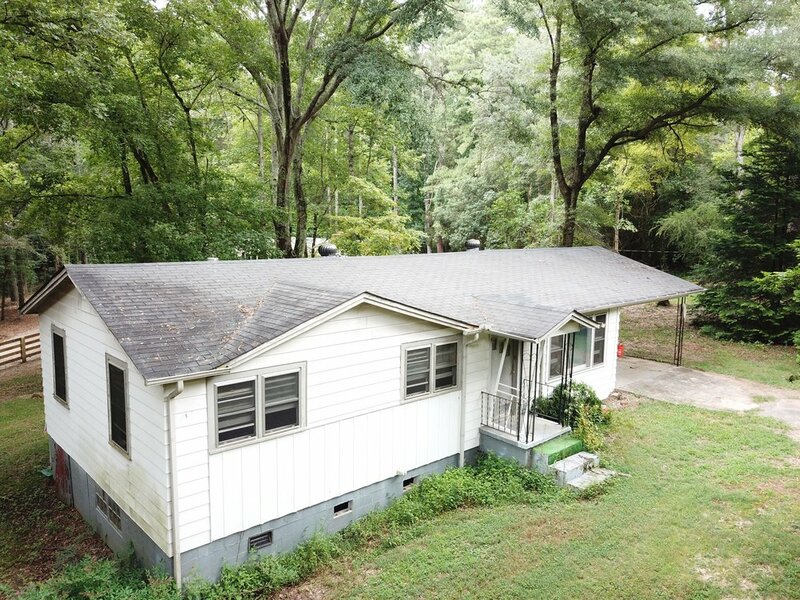 We plan to take this run-down 1960 farmhouse and turn it into a dreamy modern farmhouse where new memories can be made. We have plans to add a second story and double our square footage! I take a lot of joy turning something ugly (and almost condemned) into something beautiful! We see so much vision for this place and are looking forward to restoring its charm and character! I wish the walls of these old homes could talk and tell us of stories formed and memories made in years past! I love what I do and the variety my job entails. Whether it's restyling a house or remodeling a kitchen or finishing off a basement - I love it all! We have also done many flips for investors. But this time it's all OURS! 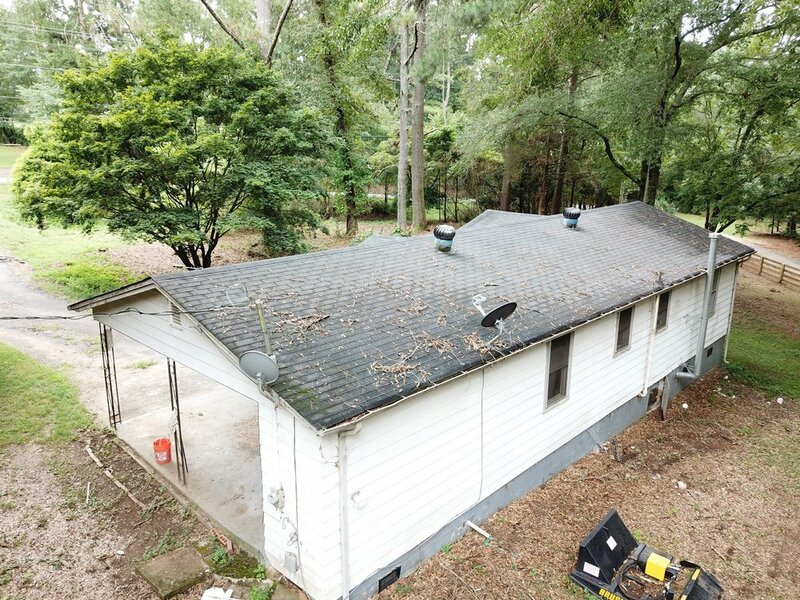 We decided to enter the adventure of house-flipping by scooping up this forgotten home to bring it back to life! Will you come along on this adventure with us?! We will be sharing updates along the way on Facebook and Instagram, so be sure you're following along. I often share details about our properties on Farm Chic Design's Instagram stories - it's a super fun way to stay updated! Cheer us on as we set out on this new adventure! Texture is one way you can add character and warmth to your home's design. We're sharing our favorite ways to incorporate texture into a home! Rugs are probably one of first things you would consider when thinking about adding texture to a room. They're always a good choice! There is nothing like bare feet on a comfy, cozy rug, especially during the colder months! You can find high piled rugs, low piled rugs and everything in between! Consider the function of the room before choosing a rug. A high piled rug would work best in a bedroom while a lower piled rug would work well in a high-traffic area! Window treatments cut through the starkness of walls and windows and add physical and visual texture to a space. No matter what style of treatment you choose, it will soften your space immensely - not to mention add a lot of color and pattern! Throw pillows are an easy and relatively inexpensive way to introduce texture into your space. The layering effect of adding pillows to a couch or chair is one way to add visual texture as well as the actual varieties of textures on the pillows themselves! You can choose from a variety of materials - cotton, linen, sheepskin, wool, silk, and leather. Many pillows even incorporate multiple materials on one pillow! You may not initially think of woods adding texture to a home, but stop and think with me. Texture doesn't just have to be something you can feel - it can be something you see! When you eyes pass through a room, there should be a variety of surfaces for them to land on - creating visual texture! Using multiple kinds of woods is one way to achieve this feel. Flooring, furnishings, and decor all play into it! Plants can add loads of texture (and color) to your space! Throw them on a side table, on a shelf, or on a console, and keep large ones secured on ground level. Keep a variety on hand - large and small, sturdy and whimsical. Plants are generally inexpensive and can pack a punch on the texture front! Decor - art, frames, candlesticks, pots, knick knacks, baskets, figurines, etc. can be mixed and matched to create a warm and textured space! Don't stick to just metal or just wood or just porcelain - mix it up! Throw in a bit of each and watch your space come alive. Throw blankets are super functional and pretty inexpensive. Keep a large basket handy with a variety of blankets handy or place a couple in specific places around the room or on a bed. Blankets are an easy addition that add so much visual layering and texture to a space! You have your choice of velour, linen, sherpa, fleece, or woven! Putting together a nursery that will grow with your child is so important - both financially and stylistically! If you create a theme that is very "babyish" you'll be forced to rethink your room plan once that baby quickly grows into toddlerhood and beyond. Here are some ways you can put together a stylish nursery with elements that will work for years to come! To start, find some inspiration photos on Pinterest! Create a board and pin away - this will help you determine what kinds of styles you love. Be on the watch for what high-end designers are doing throughout people's homes, not just in nurseries. You can take cues from their design choices and incorporate them into your nursery to create a cohesive and more grownup feel. Secondly, choose a color palette. Something soft and serene for the walls is always a good choice, though an accent wall (using more saturated paint colors or wallpaper) is a fun option too! You want a baby's room to feel restful, calm, and serene. Definitely include color but balance it out with calm places for the eye to rest. Find three or four or five colors you'd like to incorporate (including neutrals). Choosing a palette early on will help guide you as you look at decor and furniture. Next you will want to think about incorporating design elements you would use in other areas of your home - multiple textures, beautiful furniture, soft window treatments, rugs, pretty lamps, plants, and wall art. Using some or all of these elements will help the nursery fit seamlessly into the rest of the home's design! Even if the room has wall-to-wall carpeting, throw a rug on top for extra comfort and texture. Use baskets - they add function and texture! Find a unique, one-of-a-kind dresser and throw a changing pad on top instead of spending money on a changing table. Add a pop of color in your window treatments or crib bedding! Invest into a neutral, good-quality rocker - you'll use it a lot! Find a pretty dresser lamp or floor lamp for added ambiance and soft lighting. Plants are a cheap and beautiful way to pops of life to the room - keep a large potted plant on the floor or stick a few up on a wall shelf! 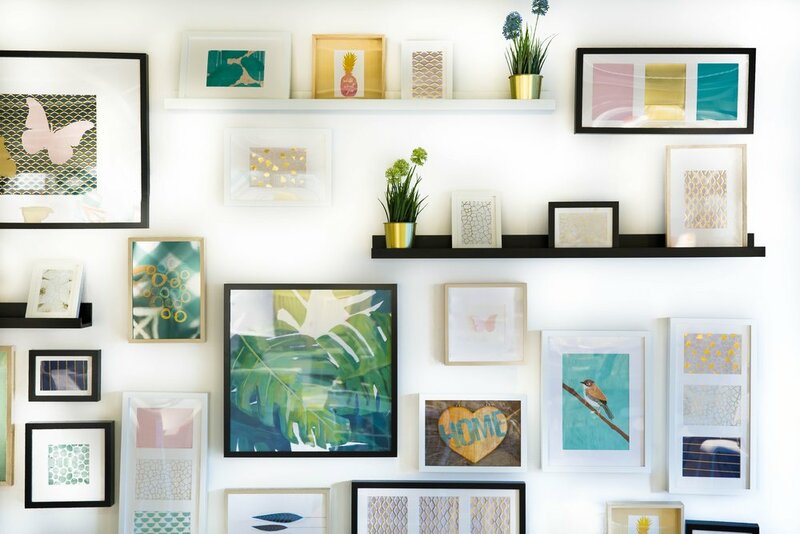 Show off your unique style with wall art that reflects who you are - maybe it's a painting, or a palette sign with a beautiful saying, or a gorgeous mirror, or multiple items corralled together on the wall! You may even choose to switch out your run-of-the-mill overhead light fixture for something a little extra special. The options are limitless! Functionality is key, especially for a child's room so put some thought into it. Keep clutter to a minimum by having "a place for everything and everything in it's place." Find a beautiful, lidded hamper for the corner of the room. Incorporate a drawer and closet organization system. Make sure you can access essentials easily and quickly - for diapering, feeding, and changing. Have an easy-to-reach place for extra sheets and blankets. Unless your child will have a dedicated play room, he or she will need space for toys in the near future. Design the room with that in mind and think about where you can incorporate book shelves or racks and toy bins. You can make your nursery both functional and beautiful! Lastly, consider how the room can easily transition from a nursery to toddler room to big kid room - they grow faster than you'd think! Using classic and neutral pieces will allow your room to last and transform bit by bit over your child's first years of life! A rug purchase is no drop in the bucket. They can be expensive and can set the tone for the entire room! Many people become intimated and don't know where to start in finding the right rug for their space. There are several factors to consider! This is probably the most frequently asked question about rugs! They come in all kinds of sizes - so which one is right for your space, you ask? Well, the short answer - the bigger the better. You want your rug to fill your space and you want your furniture's legs to overlap on top of the rug on all or most sides. This helps ground the furniture and actually makes your space appear larger! Floating a small rug in the middle of a large room will visually shrink the size of the room. So go big or go home! Most rugs we think of are rectangular in shape. And that is often a great choice! But rugs also come in ovals, circles, and some even have raw edges that give them a less precise look. Most rooms look great with a rectangular rug of some sort. But accent rugs are lovely in other shapes! And did you know you can even layer rugs?! Throw a small, sheepskin rug down next to your bed on top of the already existing rug and it adds even more visual interest (and softness)! Or toss a circular jute rug overtop of a vintage rug in your living space to add texture and an element of surprise! The color of rug you choose has a lot to do with, well - YOU! There are two different routes you can go. A rug can act as a statement piece - with lots of bold color and pattern - or it can act as a neutral piece - one which other bolder elements of the room can work off of. If you're lacking inspiration for where to begin in a room, a rug is a great place to start. Browse online or look through a store display for color and pattern ideas. If you find one you can't live without, buy it and allow it to be the springboard for the rest of your room! Find one with lots of colors and patterns you love! Then choose your furnishings, window treatments, and decor to go with that rug. OR if you desire that the rug be a more subdued element of your space, find one with light colors and minimal patterns and bring in more color and pattern using throw pillows or curtains! There are a plethora of rugs out there on the market - it's literally an endless world of possibilities! Should you buy a low piled rug or a high piled one? Which is easier to clean? Which one works better if I have kids in my home? This decision is completely personal! Low piled rugs are generally easier to clean but they tend to show stains more readily. High piled rugs are super soft and fluffy and hide stains but can be hard to clean if something drastic happens. The decision is up to you! You will find that different rugs work best in certain rooms. For example, a high piled rug would work better in a bedroom than in say, a dining room - for obvious reasons! And a low piled rug would do best in an entryway because of the door! Keep light colored rugs in areas of the house where they would be less likely to get dirty and darker rugs in areas where you could stand to hide some dirt. Use machine washable rugs in areas like bathrooms and mudrooms. Think about how you want your room to function and choose a rug that works for you! Design = form AND function so choose a rug that answers both side of the design equation! We provide fashionable, stylish, and elegant home renovation and interior design services in Atlanta, Georgia.